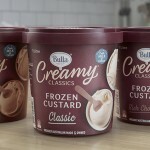 Bulla Dairy Foods has built on the success of their Lamington and Coconut Ice range with the introduction of three new flavour stick ice cream combinations. 19 dairy delicacies from around Australia have been crowned awards at the 2016 Australian Grand Dairy Awards. Bulla Dairy Foods has released an innovative single serve dispensing system for commercial retailers aptly named Bulla Real Dairy Soft. Bulla Dairy Foods is set to launch a new marketing campaign called ‘Unfakeable’ to showcase the rich history of the band.